Casey-South Melbourne skipper Luke Wells certainly has the confidence that the Swans can knock over anyone on their day, and when his group does fully gel, look out. The seventh placed Swans landed yet another scalp on Saturday, further reinforcing their stunning improvement by putting together their most “professional” performance of the year against Northcote at Bill Lawry Oval. Off the back of their gun skipper – who compiled another stellar 87 off 112 balls – the Swans won the toss and posted a healthy 8/227 off their 50 overs on a slow pitch. The Swans got off to a bright start by compiling 42 for the first wicket, but consistent wickets dented their progress, before a late charge from Wells, Jordan Wyatt (23) and Devin Pollock (26) got the visitors into a defendable position. But it was with the ball that Wells’ group once again impressed, defending their modest total for the second week in a row to restrict the Dragons to 221 after bowling them out in the final over of the day. In a stunningly even bowling effort, Jackson Fry (2/53) removed dangerous openers Solomon Mire (21) and Mark Phelan (55), Josh Dowling (2/55) did a fine job through the middle to continue his great season, while spinners Lachie Sperling (2/37) and Wells (1/35) each kept things tight too, and managed to snare three wickets between them. “I feel like he’s made a lot of progress, and he’s adapting his game to conditions really well,” Wells said of Lambden’s season. 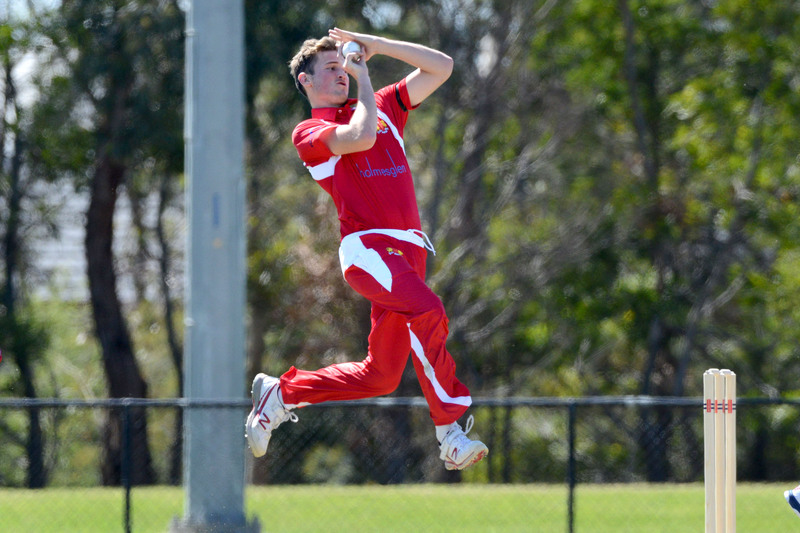 After another close win – one that sees them move to a 7-3 record and within five points of Melbourne Uni in fourth – Wells praised the bowlers for their performance, and said that the recent close victories and the ability to defend any score is pleasing. “It’s been good, and pretty stressful, I wouldn’t mind a low maintenance, less stressful win, but we’ve defended well so far in the one-day stuff,” he said with a chuckle. “We’ve got reasonable totals together without necessarily getting a match-winning one, so we’ve worked hard to defend those scores around the 230 mark – we’ve got a good blueprint at the moment, Nathan Lambden and Jacko Fry have bowled well up top, Josh Dowling as first change seamer has been good, and Lachie (Sperling) and myself have both been pretty economical. Wells said that the Swans will only get better as the red-ball cricket starts to heat up again, and can’t wait to see what his group can produce in the back-end of the season. “We’re a really talented group, and winning’s a habit, and so is losing, so the guys just expect to win, and they know what they need to do to win,” he said. “We’ve taken down some top teams – we beat Fitzroy, almost beat Dandenong in a two-dayer, beat St Kilda and other sides, and it proves that on our day, we can beat anyone in the league. The Swans will travel to take on Melbourne Uni on Saturday for a two-day game, in a massive clash for both sides.